The goal of the Cultural Revolution isn't to persuade, it's to enforce compliance. A Cultural Revolution is a movement designed to preserve the political and financial power of a ruling elite by social rather than political or financial means. Thus the primary tools of a Cultural Revolution are not redistributing power via elections (politics) or financial reforms; the primary tools are public shaming and denouncements, purges of those in positions of authority, show trials, guilt-by-association, wholesale denouncements of entire classes and widespread accusations of anti-progressive ("counter-revolutionary") tendencies in which guilt is defined by all-or-nothing litmus tests of one's loyalties to the Cultural Revolution's strict ideology. You haven't memorized Mao's Little Red Book? Off to re-education camp you go. Or house arrest, banishment, beatings, imprisonment or if the mob's blood lust demands it, execution. The key dynamic of a Cultural Revolution is the oppressors appropriate the language of liberation as their favored tool of suppressing dissent, denouncing opponents and fueling widespread purges of anyone who might harbor the slightest potential to question the social suppression of dissent. Now, more than a half-century after the Cultural Revolution began, there is little public discussion of that period in China. What some have called the nation’s collective amnesia has only gotten worse in recent years as leaders have walked back efforts to reckon with the country’s modern history. To those launching a Cultural Revolution, the solution to a diversity of opinion is to crush dissent and narratives that threaten the ruling elites' power. This is of course the exact opposite of democracy and Enlightenment-era liberalism. But the point of a Cultural Revolution isn't to broaden political enfranchisement or representation--the point of the anti-Deplorables / anti-Brexit / anti-yellow vest campaigns is to strip dissenters (those who disagree with the ruling neoliberal elites) of political and social representation. The goal of the Cultural Revolution is to render all those who resist the ruling elites politically and socially invisible. The goal isn't to play nice and share power and wealth with the losers of financialization-globalization; the goal is to liquidate their influence in politics and society via relentless negative stereotyping by the elite-controlled mass media and an Orwellian reversal of identity that makes the dissenters into threats to democracy while elevating the elitist oppressors into selfless guardians of democracy--the exact opposite of reality. 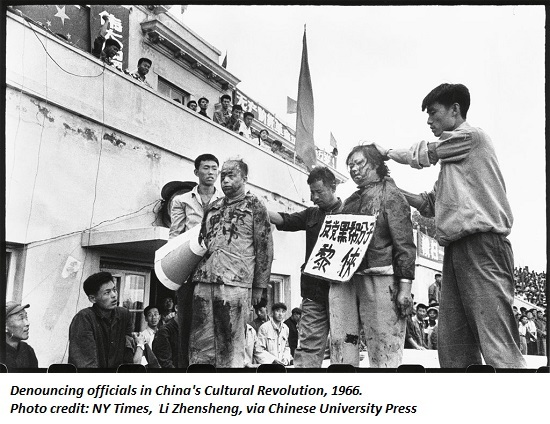 In China's Cultural Revolution, the Red Guards mindlessly destroyed much of China's priceless cultural heritage as part of the deranged agenda of destroying whatever was traditional and valued by "counter-revolutionaries." Out with the old, in with the new--the time-honored pattern of power grabs masked by utopian goals. If in doubt, purge, destroy, denounce. This is the Inquisition nature of all Cultural Revolutions. China's ruling elites don't want any unedited history of the Cultural Revolution to leak into the public sphere because virtually everyone who was killed, tortured, imprisoned or denounced was innocent. Virtually every one of the millions of victims of the Cultural Revolution was a loyal cadre or average citizen going about their lives. "Counter-revolutionaries" were an illusory, fabricated threat. Since we have many friends in China, we've heard the reality of the Cultural Revolution in private conversations, spoken in low tones even in the U.S. Nobody dares speak openly about what happened or the Party's role. One friend's father was an officer in the People's Liberation Army, a man whose loyalty was unquestioned. He was imprisoned. Another friend's father was put in house arrest for years because he'd visited Eastern Europe (at the Party's behest, of course) and was therefore suspect. In Cultural Revolutions, the "crimes" are fabricated but the destruction is real.Take a look at the mainstream media coverage in France, the U.S. and the U.K. of the yellow vest dissenters. Make a list of all the public officials, intellectuals, actors, media pundits etc. who publicly defend the yellow vests and how many denounce them. Did you find any articles on the yellow vests on Page One? What percentage of the corporate-state media depicted the yellow vests as violent, unreasonable, and so on? If you pursue an objective survey, you'll find few public figures supporting the yellow vest movement and little mainstream media coverage that presents the yellow vest movement in a positive light. That's how Cultural Revolutions roll. The Nobility in our neofeudal system will work all the levers of power to marginalize, demonize, stereotype and disenfranchise any threats to their power. The goal of the Cultural Revolution isn't to persuade, it's to enforce compliance. Virtue-signal your compliance in social media every day (i.e. wave your Little Red Book publicly) or you become suspect. Nobody cares what you actually believe, the point is to prove your compliance and complicity to those enforcing compliance and complicity. Thank you, Jay S. ($5/month), for your splendidly generous pledge to this site -- I am greatly honored by your steadfast support and readership. Thank you, Ted B. ($5/month), for your superbly generous pledge to this site -- I am greatly honored by your support and readership.